Even though it is quite a bit older than the baccarat games we know and love, many people don’t know a thing about baccarat banque. This isn’t all that surprising, as the style is mostly played in France and there isn’t much clear, easily accessible information about it in English. So what makes this variant different, and are there any versions available at our trusted online casinos? The aim is essentially the same as in regular baccarat: to bet on the hand which scores the highest. But whereas punto banco is simply a matter of putting down a wager and crossing your fingers, there’s quite a bit more you need to know about baccarat banque. The first order of business is to determine who will be the banker. This honour typically goes to whomever puts up the highest stake; sometimes, however, the first person to sign up for the game will take on the role. Compared to big baccarat (punto banco) and chemin de fer (chemmy), the bank is more permanent in this form of the game. Whichever player takes on the role at the beginning holds that post until either the whole shoe is played through, or they run out of funds, or they decide to resign the position. In modern European casinos, the house often keeps hold of the bank. This might be through a 5% commission on all banker wins, or by soliciting enormous bids from VIPs and wealthy syndicates for the right to control the bank. Thus, as with chemmy and punto, the baccarat banque tables tend to be exclusive affairs awash with high-stakes gamblers. Baccarat banque is played on an oval table which accommodates up to 10 seated players (sometimes 16) as well as the banker and the croupier. The latter two face each on either across the centre of the layout, with the remaining positions divided equally on each side. This setup effectively splits the game into two halves, which is why the French often call it baccarat a deux tableaux – literally, ‘baccarat on two tables’. While chemmy (six), punto banco (eight) and most other table games use an even number of decks, baccarat banque is most commonly played with three standard French decks of 52. After all bets are placed, the croupier shuffles the shoe and then hands it to the players on his/her right and left to shuffle again. The banker takes the deck for one last shuffle and then deals the game. This is where deux tableaux baccarat deviates most starkly from its siblings. The banker deals one face-down card to the player on their right, then to their left, then to the bank, and repeats. Thus, we get three two-card hands: one for players on the right half of the table, one for punters on the left, and one for banco. This means the bank plays against not one, but two punto hands. In baccarat punto banco, players can bet on either the banker, the player, or the tie. In baccarat banque, however, the banco hand is reserved solely for the player who holds that office (or the casino, if the house holds the bank entirely). Thus, the remaining punters can only wager on the player hands. Although the two punto hands are supposed to serve each half of the table, you don’t always have to bet on the hand closest to you. No matter where you are seated, you can wager on either the near hand, the far hand, or both at once. The latter option is called playing ‘across the line’, as you place your stake on the stripe running between croupier and banker in the middle of the table. Like chemmy baccarat, there is a specific run of play when it comes to making wagers. The punter on the dealer’s right has first option, then to the dealer’s left, and so on in alternating order. Whomever has the play may have the option to ‘go bank’ – that is, match the banker’s entire stake. Only one punter may do this per hand. This is often done by covering both sides of the table at once, with half the total bet going on each hand. If a player banks only hand, another may player may do the same on the other hand; in this case, they share the stake and half their bets are returned. When a player takes on the bank and loses, they get two more chances to win back their share. If they lose both those challenges, they cannot go bank again for the remainder of the game. The exact policy for wagering limits can depend on either the banker or the house rules. In most cases, the total table limit is equal to the banker’s bet; so if the bank stakes $1000, the combined amount of player bets cannot exceed that amount. However, the banque may decide to cover any surplus bets on the table, in which case he is obliged to do so for every hand thereafter. Otherwise, the croupier will remove any excess wagers in reverse playing order (i.e. the last bet is returned first). Baccarat deux tableaux often draws large crowds of bystanders. If the seated players’ combined stakes fall short of the amount in the bank, those onlookers can place bets to make up the difference – but only after the punters at the table have made their wagers. 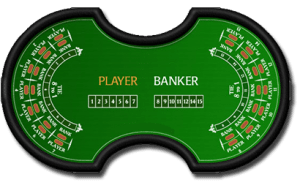 The players immediately left and right of the banker represent their respective halves of the table. They hold this position as long as they keep winning; as soon as they lose their hand, the honour passes to the next person in the playing order. Technically speaking, the player controlling the hand can do whatever he or she likes on a total of seven or less. With the rest of the table’s money on the line, however, it is considered very bad form to stray from traditional drawing norms. In terms of tactics, players should look to vary their decision-making when the initial hand score is five. You don’t want to become predictable to the banker; if you always hit or always stand, they can then adjust their drawing strategy accordingly. But if you keep mixing up your moves on five, it makes it much harder for the dealer to get a clear read on your hand. Acting as the bank is a little bit more complicated than being a punter, as there are two separate player hands to account for. The bank must declare and compare a natural out of the hand, just like the players, but otherwise there are no set laws regarding when to stand or draw. And as the dealer only has their own cash to consider, there’s much less pressure to adhere to standard chemin de fer rules (although, strategically speaking, they are often the best way to go). There is one convention most bankers stick to, however, and for good reason. When making decisions over standing or drawing, it is common policy to play against whichever hand has more money riding on it. This is simple logic – for if you can only beat one of the two punto scores, it’s makes much more sense to play the one that will get you back more of your stake. As far as we know, there are no online casinos which run real money baccarat banque games. This is mostly down to logistics mostly, as well as the overwhelming worldwide popularity of online punto banco games. The very nature of the deux tableaux format makes it very difficult to adapt for Internet play. It would have to be a live multi-player game, for starters, as you need at least three players (one banker, two punters) to cover all the hands. The betting rules would be especially tricky to execute well, not least because there would be no bystanders to chip in when players can’t match the banker bet. And it wouldn’t work as a live dealer casino game, as cards are dealt face down and there would be no way for players to flip them over. So if you want to play baccarat banque for real cash, you will probably have to book a trip to Europe and visit the brick-and-mortar casinos of France and Monaco. But if it’s the convenience, security and big rewards of Web gambling you want, there are heaps of other online baccarat options at our top-ranked online casino sites.